VIDEO: BMW M5 vs Mercedes-AMG E63 S -- Which can Drift better? VIDEO: BMW M5 vs Mercedes-AMG E63 S — Which can Drift better? We’ve seen almost an exhausting amount of comparisons between these two cars. The F90 BMW M5 and the Mercedes-AMG E63 S are the undisputed kings of the super-sedan world. Which one is best is really just a take-your-pick type decision because they’re both so excellent and both so well-matched that it’s near-impossible to choose a better car among them. They both also offer a similar concept, the ability to switch their all-wheel drive systems off and do many, many two-wheel drive skids. So which one is better at that? Auto Express attempts to find out. The all-new BMW M5 uses a 4.4 liter twin-turbo V8 to make 600 hp and 553 lb-ft of torque (although, a recent dyno test showed it actually making closer to 700 hp and more than 600 lb-ft). While the AMG E63 S uses a 4.0 liter twin-turbocharged V8 with 603 hp and 664 lb-ft of torque. So, as you can see, both are more than qualified to turn tires into smoke. With editors Steve Sutcliffe behind the wheel of the BMW M5 and Sean Carson piloting the AMG, we get to see just how well both cars drift. 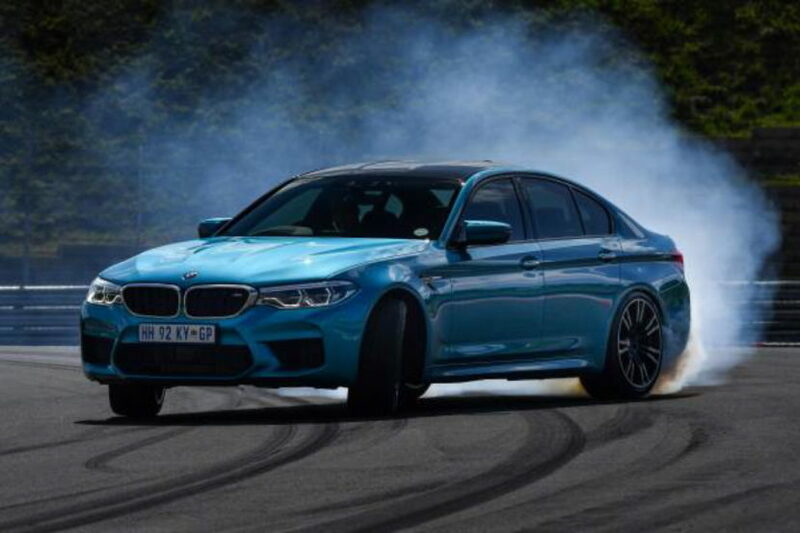 When they’re both in their respective rear-wheel drive modes, 2WD for the M5 and Drift Mode for the AMG, they are professionals in the field of destroying tires. Without driving both back-to-back, it’s impossible to tell which is best because they’re both so effective at ruining rear tires. However, Sutcliffe seemed to have be having more fun in the BMW than Carson was in the AMG. He had a massive grin on his face every time he made a big left-right transition, entirely sideways, in the M5. What’s interesting is that it actually has a surprising amount of grip in rear-wheel drive mode, despite having so much power. He also claims it to be a bit more enjoyable to drift than the AMG, with just ever-so-slightly better balance. Though, he wouldn’t blame anyone for taking the AMG, as it’s also excellent. Has this site ever published a more irrelevant story? Coming back to me why I blocked him.